How Much Money Do I Need To Live In Bangkok? Living in Bangkok is very different to visiting as a tourist. When you’ve got only a couple of weeks in the country and a bunch of hard earned cash burning a hole in your pocket, Bangkok can seem very very cheap. 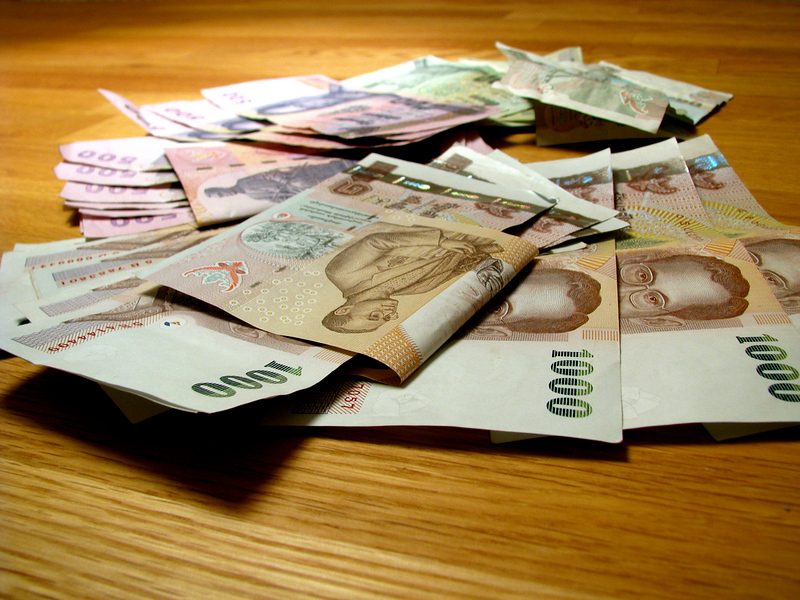 When you’re living in Bangkok and you don’t have a huge income, it’s easy to spend money without realising it. Bangkok is certainly much cheaper than Hong Kong or Singapore, but you still need to keep an eye on your budget to get the best value out of the city. There are many cheap places to live in Thailand – but Bangkok is not one of them. As the capital city of the country and one of the major financial hubs of South East Asia, Bangkok is actually quite expensive if you want a Western style apartment with all mod cons like airconditioning, and if you want to be located near a Skytrain or underground MRT station. (Trust me, you definitely want to be located near one of these unless you want to spend a lot of your life stuck in traffic – see What You Need To Know About Bangkok Traffic if you need further persuasion). Where can you find these rooms to rent? See my list of Where To Find An Apartment In Bangkok – but it might help to read the following first so you’ve got a better idea of what your money will get you. You can rent a very basic room in Bangkok for around 5000 – 10,000 Baht a month – it will probably be about 30 square metres, have its own bathroom with shower and toilet and have some furniture of varying quality for bed, table, chairs. It should have a fridge and fan and a kitchen sink, but will not necessarily have hot plates for cooking. (You can buy a plug-in hot plate for around 1500 Baht). It may have an airconditioner, although you have to check the air con unit’s age, as it might be so inefficient as to rack up huge electricity charges without actually cooling the room. There are some definite bargains to be had in this price bracket if you willing to look hard enough, but often rooms at this price have not been well cared for – you really need to check and test everything to make sure you’re happy with it. (see the checklist below). You also need to be aware of the environment of where cheap rooms are located i.e. do the neighbours seem friendly and polite, is there 24 hour security on the building and are there sufficient exits in terms of fire escapes. The room will probably be a taxi ride away from the nearest Skytrain or MRT stop. This means getting to and from home can be hard work at times, especially when it rains. See Where To Rent In Bangkok for an idea about different Bangkok districts. These rooms are much more likely to be in the newly opening city suburbs like Lad Prao. Getting the feel for the local neighbourhood is also important – you need to feel safe where you are and feel confident of getting to and from your prospective home without getting lost. When you pay between 10,000 to 15,000 Baht, you can find some good quality studio apartments – also around 30 square metres – in central areas of Bangkok like Thong Lor and other districts of Sukhumvit, the main artery road of the city. These apartments are usually within walking distance of the Skytrain or MRT. Often these apartments are serviced, meaning a maid will come and clean once a week, either inclusive in the price or for a set monthly fee. There are also usually English speaking staff that work in the Admin section of the apartments and can help you with paying bills and if there are any problems with your apartment (leaking pipes, non-flushing toilet etc). The quality of decoration and furniture should be better, fridges, freezers and air-con will be standard, (although there might still be no kitchen hot plates), and televisions and wifi may well be provided. (Wifi is often free or has a nominal fee of around 500 baht a month; tenants usually have to sort out and pay for their own Cable TV package which starts around 1500 Baht a month if you want English language channels). When you pay between 15,000 to 25,000 you can find good quality one and two bedroom apartments that are anywhere between 50 to 80 square metres. Above 25,000, there is a huge variety of accommodation in Bangkok – if you can afford to spend around 35,000 a month (roughly $1000 US) then you can live extremely well. Electricity, water, cable TV and internet are the main utilities you will need to pay in Bangkok. You will also need to work out a source of drinking water, as it’s not safe to drink Bangkok water from the tap. Some apartments have a purified water dispenser that is usually very cheap – alternatively you can use a service like Sprinkle which delivers watercooler-sized bottles of water to your door each week, also for very little cost. Water (as in shower/washing water) is usually a couple hundred baht a month. Cable TV is around 1500 Baht a month. Wifi 500 Baht a month from the building, or you can get your own wired connection installed using True or TOT. Installation is typically 1500 Baht and then 700 Baht per month thereafter. You will also need to activate the phone line for the internet connection which is another couple of hundred baht. You can see that bills can stack up to around 4000 to 5000 a month on top of rent. Obviously not having cable TV and being frugal with electricity use can halve this. Is there maid service to clean the room and if so, what price? Do the admin staff speak any English? If not, who do you speak to to get a problem fixed? If you do like the apartment you’ve found, be sure to get a copy of the lease (in English!). Bangkok is actually one of the gourmet cities of the world – it’s not just Thai cuisine, but virtually every cuisine you can think of. Foreign food has one thing in common though – it’s a lot more expensive than Thai food. There are numerous Western style supermarkets in Bangkok packed with great food, beer and wine – and it’s all available at a price. Similarly, foreign restaurants – whether it’s French, Mexican, Indian or from anywhere else – can be quite expensive. On the other hand, you can get great pizza delivered to your door for under 400 Baht. If you’re happy to eat at street stalls and night markets, you can get buy on 20 to 50 Baht per meal. This is not necessarily the best way to maintain a healthy diet longterm. Fresh fruit (bananas, papaya, watermelon) are also readily available from street sellers and very cheap. You can eat Western food at a chain cafe Au Bon Pain for around 100 Baht a sandwich and 70 Baht for a cafe latte. (Starbucks, by comparison, charges 90 Baht for a medium latte and 70 to 100 baht for food items). You’ll need groceries eventually so you should budget 500 to 1000 Baht a week for things like milk, cereal, eggs, orange juice etc, depending on how frugal you wish to be. If you like going out on the town, you’ll quickly find Bangkok a very expensive place. You can pick up Heineken beers for 35 Baht a small bottle in 7-11 – even cheaper if you go for Thai domestic brands like Leo or Cheers – but when you’re out in a bar, it will be minimum 70 baht for the same – sometimes 100 Baht in trendier spots – and around 150 for a pint, sometimes as much as 220 Baht a pint for premium imports like Guinness. 220 Baht is nearly London prices for a pint. A few beers and a cheap meal can easily add up to 600 – 700 Baht a night. Wine in Thailand is heavily taxed and even dreadful plonk costs around 500 Baht a bottle from supermarkets. You would really have to watch your spending to keep within this amount, but it’s certainly doable. There are many English teachers in Bangkok earning 35 to 45000 Baht who still manage to save and travel. Obviously, there are endless variables as everyone’s priorities are different. You can also see how the numbers scale – if you were to rent a more luxury apartment, that easily adds another 10,000 to 20,000 onto your costs – and if going out is important, that will jack up the budget too. Eating is one area that if you like Thai food a lot you save a fortune – for most Western palettes however, after the initial novelty wears off, there is a craving for other cuisines. (Eating the same of anything gets dull however good it is).